Now that Japan had declared independence from China, Empress Suiko and her successors built a new government for Japan. They wanted Japan’s government to be just as good as China’s government. Empress Suiko ruled for 35 years before she died in 628 AD. Prince Shotoku had already died six years earlier, when he was only fifty years old. One of Bidatsu and Nukate-hime’s grandsons, Emperor Jomei, ruled after Suiko. Soga no Emishi, the new leader of the Soga family, was his adviser. After Jomei, the next Japanese ruler was Jomei’s niece and wife, Empress Kogyoku. Kogyoku ruled for a couple of years. But then the Soga family tried to seize power. Jomei and Kogyoku’s son Tenji killed Soga no Iruka right in front of her throne. And Soga no Emishi, Iruka’s father, killed himself soon afterwards. That ended the power of the Soga. Kogyoku stepped down to let her brother, Emperor Kōtoku, rule. They had the backing of a new powerful family, the Fujiwara. When Kotoku died a few years later, Kogyoku stepped up again. She ruled for another six years, with the help of Tenji, who had married into the Soga family. In 660, Korea, like Japan, became unified, and pushed out the Japanese colony there. In the next year Kogyoku died while she was getting ready to personally lead her army to Korea to try to reconquer the colony. Tenji took over as Emperor. But he abandoned his mother’s attack on Korea. In 662 Emperor Tenji published Japan’s second important government document: its first formal law code. He may have been influenced by a general interest in law codes across Eurasia at this time. His youngest half-brother Tenmu succeeded him after a struggle. The Soga family tried to seize power again, and Tenmu threw them out in 645 AD and made a lot of changes in the government to make the emperors stronger and the other powerful Japanese families weaker. These changes, which we call the Taika Reforms, copied the changes made a little earlier by the Sui Dynasty emperor Wendi and T’ang Dynasty emperor T’ai Tsung in China: mainly, he redistributed the land, and created a stronger government bureaucracy including a lot of state-supported Buddhist monks and nuns, and built good roads like the Persians and the Romans. 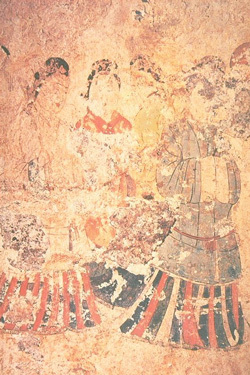 Tenmu’s niece (Tenji’s daughter) Jito became empress after Tenmu died in 686 – just as the Empress Wu Chao was ruling China – and ruled for eleven years. Jito built a new planned city as her capital – as Li Shih-min had at Chang’an in China – to hold all the new administrators, and started a draft for soldiers to raise a more professional army. When Empress Jito got older, she retired (as the T’ang emperor Li Yuan had sixty years earlier), though she still had a lot of power. Jito’s younger half-sister, the Empress Genmei, ruled after her, first as regent for her teenaged son Mommu, and then, when Mommu died at 25, on her own. In 707, Empress Genmei issued a new law code, the Taiho Code, formalizing the new administration, again copying T’ang Chinese laws. Empress Genmei also built a second, larger planned city for the new government, this time at Nara, and the government’s move to Nara in 710 AD marks the end of the Yamato period. Cite this page: Carr, K.E. Taika period – Early Medieval Japan. Quatr.us Study Guides, July 27, 2017. Web. April 20, 2019.